The School of Architecture will cap off an exciting academic year with thesis reviews, the Thesis Prize Jury competition and an exhibition of student work. On Monday and Tuesday, April 22-23, the school will host its annual final thesis reviews. Students, faculty and staff are invited to Slocum Hall to watch as Bachelor of Architecture (BArch) and Master of Architecture (MArch) degree candidates present their final thesis projects to a group of Syracuse Architecture faculty reviewers. Both the BArch and MArch professional degree programs culminate with thesis projects. Working as individuals or in collaborative teams, students pursue research and design with an advisory group of faculty on topics related to their expertise. The thesis year is an opportunity for students to synthesize the varied aspects of the curriculum in ways that focus on particular issues or opportunities in the field, allowing them to explore architectural knowledge and practice in a deeper and more complex way than occurs in their prior design studios or other courses. “As emerging architects and overall design professionals, (thesis is a) rite of passage for finding our own voice within the professional world and in our projects to come,” says Nathalie Brock, 2019 MArch candidate. For nearly four decades, hundreds of theses have been presented at Syracuse Architecture covering topics that are as varied as the interests of the students and the faculty, and that engage the most compelling ideas at that time. Students are encouraged to focus on issues they’re passionate about, that nourish them intellectually and that situate them to make unique contributions to the discipline. “It’s a great way to end an academic career, because you’ve taken all that you’ve been studying and learning for three or five years and built it into that project that helps transition you into what you want to do with your career,” says Brian Lonsway, associate professor and graduate chair at Syracuse Architecture. Through a combination of research and creative exploration, students develop a question, conduct research across multiple disciplines and produce an impressive amount of design work, ranging from sketches to digital models to material studies, scale models, sophisticated renderings and writing. “I focused on trying to organize my project around tangible trends in practice and the academic discourse in architecture,” says Kokeith Perry II, 2019 BArch candidate. At the final reviews, which are open to the public, the projects are presented to a group of faculty who critique their work and vote on its merits for inclusion in the Thesis Prize Jury. “You become an expert at something…you are able to name that Thesis—it’s a contribution to the larger field,” says Jennifer Bonner, director of MALL and assistant professor at Harvard University Graduate School of Design. 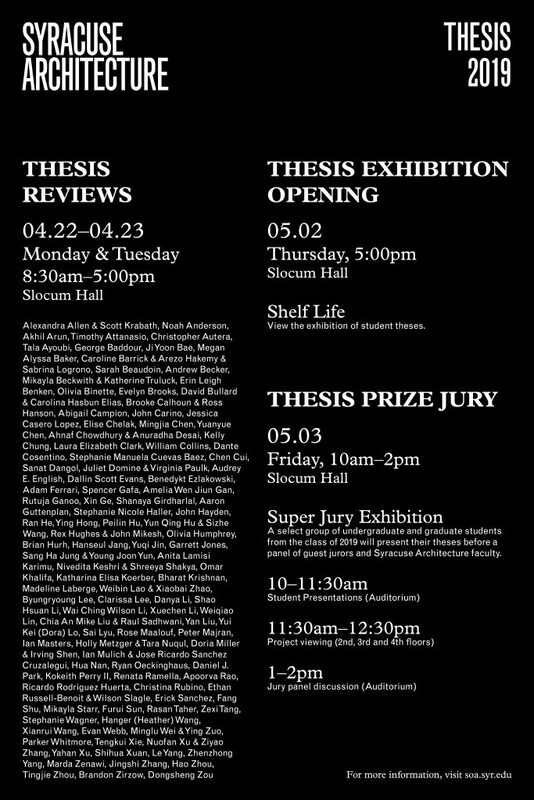 The full schedule of thesis presentations can be found at soa.syr.edu/calendar. The annual Thesis Prize Jury competition will be held on Friday, May 3, in Slocum Hall. A select group of undergraduate and graduate students from the Class of 2019 will present their theses before a panel of guest jurors and Syracuse Architecture faculty. Joe Day teaches design and theory at SCI-Arc and is a partner at Deegan Day Design, Los Angeles. Jia Gu is director and curator at Materials & Applications, Los Angeles, and co-director of Spinagu. Nina-Marie Lister is associate professor in the School of Urban and Regional Planning at Ryerson University and founding principal of PLANDFORM. Brittany Utting teaches at the University of Michigan Taubman College of Architecture + Urban Planning and is co-founder of the design collaborative HOME-OFFICE. Gretchen Wilkins is head of the Architecture Department and architect-in-residence at the Cranbrook Academy of Art. Students who participate in the Thesis Prize Jury event compete for awards that will be announced at the 2019 convocation ceremony—the Dean’s Thesis Citations and James A. Britton Memorial Awards. This year’s Brittons will include the Jury Prize, Faculty Prize and Best Thesis. The Thesis Prize Jury event is open to the public. Presentations will take place from 10 to 11:30 a.m. in Slocum Auditorium. There will be an opportunity to view projects throughout Slocum Hall from 11:30 a.m. to 12:30 p.m., followed by a panel discussion with the jurors from 1 to 2 p.m. In addition to Thesis Prize Jury, the School of Architecture will host an end-of-year exhibition titled “Shelf Life” that’s a collaborative production of the entire class of 2019 thesis students. This year’s “Shelf Life” is the third version of a framework for students to playfully collect and assemble a range of objects that can convey or display the interests that have motivated their thesis investigations, or been produced along the way. The final form of this year’s exhibition is a large-scale video projection that combines and compares those objects in a dynamic and dramatic way. “It celebrates a key transitional moment in the lives of the students and the importance of thesis to that transition, when they are moving into the first stages of their professional careers and, hopefully, will continue to pursue their thesis interests in exciting ways,” says Professor Mark Linder, “Shelf Life” co-curator and thesis director at Syracuse Architecture. “Shelf Life” opens at 5 p.m. on Thursday, May 2, in the Visiting Critics Studio on the first floor of Slocum Hall and will remain open to the public as part of the reception that immediately follows Syracuse Architecture’s 2019 convocation ceremony on Saturday, May 11.